"I want to thank all who volunteered and came to Joplin to help with communications as well as those who are still contacting me to see if additional help is needed. Due to the ending of the search and recovery mode and going to the debris and potential body part removal functions, the decision was made that effective at the end of shift today (Monday, May 30, 2011) all ham communications from the EOCs to the field operations are being stood down. We do have some ARES® operators that are scheduled and will continue to work with SATERN through the rest of this week. "Ham communications between Springfield and Joplin started Sunday night between Freeman Hospital in Joplin and some of the hospitals in Springfield as that was the only means of communication. The links were shut down Monday morning when their needs were met. Likewise, the radio station at the Springfield Red Cross was started Sunday evening to allow communications between the Springfield and Joplin offices and to the shelter that was set up in Joplin. That communication link stayed open until Tuesday as it was the only reliable method of communications. "I asked Cecil Higgins, AC0HA, Assistant DEC for District D, to respond to Joplin on Tuesday morning and act as "Ham in Charge" during the disaster and help to set up additional communication links as required. Thomas Zeller, KB0ORZ, EC for Jasper County, and LaVerne Wilson, NQ0B, EC for Newton County, were already in place, with members of their respective ARES® groups trying to support the EOCs and Red Cross, but relief was needed. FEMA Administrator: Amateur Radio "The Last Line of Defense"
The ARES® Forum and ARES® booth were popular areas at the 2011 ARRL National Convention at Ham-Com in Plano, Texas, this past weekend. ARRL Emergency Preparedness Manager Mike Corey, W5MPC conducted the standing room only ARES® forum. Corey gave the same program that he presented in Dayton and received another enthusiastic, positive response from the audience. Topcis covered during the ARES® forum included: training, creating a positive public image, actions we can take to improve ARES®, and dispelling some emcomm myths. Several good questions and comments came from the Texas crowd. ARRL Southeastern Division Director Greg Sarratt, W4OZK, reported enjoying talking to many emcomm-oriented convention-goers from Texas and the entire region at the League's National Convention ARES® booth. Many hams were interested in the ARES® response and incorporation of D-STAR in the April Alabama tornado outbreak. Sarratt said "the Texas hams have a fine ARES® program, and I enjoyed their hospitality and greatly appreciate their well wishes for the Alabama Tornado victims." 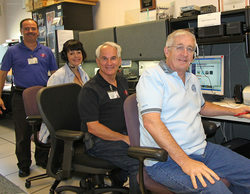 The crew at WX4NHC performed its annual National Hurricane Center Hurricane Season Station Test on June 4. This is our 31st year of volunteer public service at the center. The station radio equipment and antennas were tested on multiple frequencies and fine tuned for what may become a busy season by some predictions. We made more than one hundred contacts on HF around the USA, Canada, with several Caribbean countries, and even as far as England. We also tested several of our local repeaters on VHF/UHF. using a similar format used during our hurricane activation as a practice test, which resulted in several dozen contacts. The WX4NHC operators for this test were: AF4VJ, K4AG, K4PAA, KJ4YDX, WB4L, WD4R and WX2L. We welcomed a new WX4NHC operator, Mike Kelley, KJ4YDX, who recently upgraded to General. Kelley is the Vice Chairman for the University of Miami School of Medicine and was Chief Operating Officer for the UM/Medishare Haiti Mission Command Center and Field Hospital in Port-au-Prince, Haiti, in the aftermath of the earthquake. In January, 2007, a landmark report with recommendations was tendered with the ARRL Board of Directors at their Annual Meeting. The document was the culmination of the hard work and deliberation of the ARRL National Emergency Response Planning Committee, a special select group chaired by then-Vice President and current ARRL President Kay Craigie, N3KN. One of the key concepts proposed by the committee was the Major Disaster Emergency Coordinator (MDEC) appointment. The idea was to have a manager who would coordinate Amateur Radio operations, operators and resources supporting served agencies during a major disaster relief operation when section and regional ARES® assets are overwhelmed similar to operations performed in the Hurricane Katrina response. The MDEC's line of authority would be derived from the ARRL's disaster response emergency manager at HQ and would parallel the affected area's Section Managers. The MDEC position was envisioned to be a continuous appointment but would only be active when called upon by the HQ manager. The recommendation was to have the MDEC be responsible for the "establishment of an as needed emergency communications structure - the Disaster Field Team - designed to fulfill served agency requests and/or augment the existing Field Services structure established by the Section Manager." The Disaster Field Team (DFT) would be assembled from the ARRL national ARES® database. The purpose of the DFT would be to provide support for the infrastructure of relief organizations that bring resources into the disaster zone and cannot be served by the local Field Organization. The MDEC function has been tested in exercises with served agencies and ARES with success. The ARRL Emergency Communications Advisory Committee (ECAC) is currently drafting appointment protocols and requirements. As presently conceived by the committee, there will be several MDECs geographically arranged by ARRL Division. The geography, and hence the actual MDEC headcount, is being determined at this time. The ECAC was established at the January, 2010 Board meeting. Each of the 15 ARRL Divisions has a representative on the ECAC. There is also a representative from Radio Amateurs Canada, a Board of Directors liaison, and a HQ staff liaison. Committee members are exceptionally qualified and recognized members of the emergency communications community. The committee will report its recommendations and draft appointment guidelines to the Programs and Services Committee. Members include: Jim Cross, WI3N (Atlantic Division); Bill Niemuth, KB9ENO (Central Division); Jim Zahradnicek, KDØS (Dakota Division); Jim Coleman, AI5B (Delta Division); Chairman Dale Williams, WA8EFK (Great Lakes Division); Jim Mezey, W2KFV (Hudson Division); Reynolds Davis, KØGND (Midwest Division); Dave Colter, WA1ZCN (New England Division); Gordon Grove, WA7LNC (Northwestern Division); James R Latham, AF6AQ (Pacific Division); Charlie Miller, AE4UX (Roanoke Division); Jeff Ryan, KØRM (Rocky Mountain) ; Rick Palm, K1CE (Southeastern Division); Grant Hays, WB6OTS (Southwestern Division); Glen Reid, K5FX (West Gulf Division); and Doug Mercer, VO1DTM (Radio Amateurs of Canada). Board Liaison is Mickey Cox, K5MC. And Staff Liaison is Mike Corey, W5MPC. A: After World War II, it became evident that the international situation was destined to be tense and the need for some civil-defense measures became apparent. Successive government agencies designated to head up such a program called on amateur representatives to participate. RACES is administered by local, county and state emergency management agencies, and supported by FEMA. It is a part of the Amateur Radio Service that provides radio communications for civil-preparedness purposes only, during periods of local, regional or national civil emergencies. These emergencies are not limited to war-related activities, but can include natural disasters such as fires, floods and earthquakes. RACES operation is authorized by emergency management officials only, and this operation is strictly limited to official civil-preparedness activity in the event of an emergency communications situation. While operating in a RACES capacity, RACES stations and amateurs registered in the local RACES organization may not communicate with amateurs not operating in a RACES capacity. Such restrictions do not apply when such stations are operating in a non-RACES--such as ARES®--amateur capacity. Only civil-preparedness communications can be transmitted. Although RACES and ARES® are separate entities, the ARRL advocates dual membership and cooperative efforts between both groups whenever possible for an ARES® group whose members are all enrolled in and certified by RACES to operate in an emergency with great flexibility. Using the same operators and the same frequencies, an ARES® group also enrolled as RACES can "switch hats" from ARES® to RACES and RACES to ARES® to meet the requirements of the situation as it develops. For example, during a "nondeclared emergency," ARES® can operate under ARES®, but when an emergency or disaster is officially declared by a state or federal authority, the operation can become RACES with no change in personnel or frequencies. This situation is still not well understood and accepted throughout the United States; both ARES® and RACES still exist, separately, in many areas. Where there is currently no RACES, it would be a simple matter for an ARES® group to enroll in that capacity, after a presentation to the civil-preparedness authorities. In cases where both ARES® and RACES exist, it is possible to join both or to be involved in either. As time progresses, the goal would be the merger into one strong organization, with coordination between ARES® and RACES officials using the same groups of amateurs. In some sections of the U.S. today, the ARES® structure has also been accepted as the RACES structure. Fugate said that he thinks "we get so sophisticated and we have gotten so used to the reliability and resilience in our wireless and wired and our broadcast industry and all of our public safety communications, that we can never fathom that they'll fail. They do. They have. They will. I think a strong Amateur Radio community [needs to be] plugged into these plans. Yes, most of the time they're going to be bored, because a lot of the time, there's not a lot they're going to be doing that other people aren't doing with Twitter and Facebook and everything else. But when you need Amateur Radio, you really need them." Readers can watch a video of the forum on YouTube. Fugate's remarks begin at 18:55. Here are three ideas for future editions of the ARES® E-Letter. First, with more than 35 years in AREC and ARES® communications, a question was posed at an ARES®/RACES meeting this past Monday evening which I could not answer. Basically, has anyone assembled a profile on the quantities of messaging traffic typically experienced during various types of emergency ARES® and RACES activations? Those posing this question are not looking for an answer based on bands and modes of operation, but more along the lines of rough percentages of tactical voice communications vs. written traffic support by type of emergency. Uncovering this data from other areas would help improve resource planning and training in this Section, and I presume other recipients of the ARES® E-Letter across the country as well. The second topic I would like to suggest is sharing of District-level and Section-level written plans that outline mutual aid agreements for sharing of re-deployable ARES® resources among counties, districts, and sections. On May 24 through May 26 all roads led to the heart of the country for the 19th Annual NVOAD Conference at the Hyatt Regency Hotel in Kansas City, Missouri. The mission and purpose of NVOAD (National Voluntary Organizations Active in Disaster) is to provide a forum where organizations share knowledge and resources throughout the disaster cycle -- preparation, response and recovery -- to help disaster survivors and their communities. The conference was well attended, with 550 people checking in. ARRL is a national member of NVOAD. A number of forums gave participants the opportunity to hear firsthand from the other organizations about their roles in aiding with disaster recovery. Over 30 organizations had booths displaying the various services they provide, ranging from small portable water purification units, clothing items made from plastic bottles and even shrink-wrapped diaper packets! The importance of such a forum was punctuated by the devastating tornado in Joplin just before the conference began. In addition, during the first full day of the conference several tornadoes were sighted nearby and were reported to be heading toward the downtown area. Appropriate precautions were taken and attendees were directed to suitable shelter. Fortunately, no damage occurred. The Service Project during the conference was greatly enlarged this year with the beginning of construction of a house for a local family. Another hands-on project in which my wife and I participated during the event included packaging food kits to be sent to Louisiana in preparation for the upcoming hurricane season. Jim Andera, KØNK, from Gardner, Kansas gave an excellent presentation on "Amateur Radio in Emergencies and Disaster Relief Efforts." He first provided background on Amateur Radio and the different modes that amateurs use. He went on to describe the communication capabilities amateurs can provide in disaster communications. After the session, a number of people wanted to know more about Amateur Radio and its public service aspects. Andera left the convention to lend a hand in Joplin. One of things missing from many tornado reports is discussion of the insidious psychological traumas that are inflicted upon survivors that linger forever after the media trucks and emergency management vehicles have rolled out of town. A good friend of mine, Dan Woll, wrote of his personal experience in a gripping account published in the Cap Times, Wisconsin, a few days ago. It helps us as responders to have a deeper empathy for what the survivors are going through, and what they will go through for the rest of their lives, Click here for a must-read.